Heading back north on Main Street in High Point, North Carolina, I found the following in two of the windows of a commercial building. 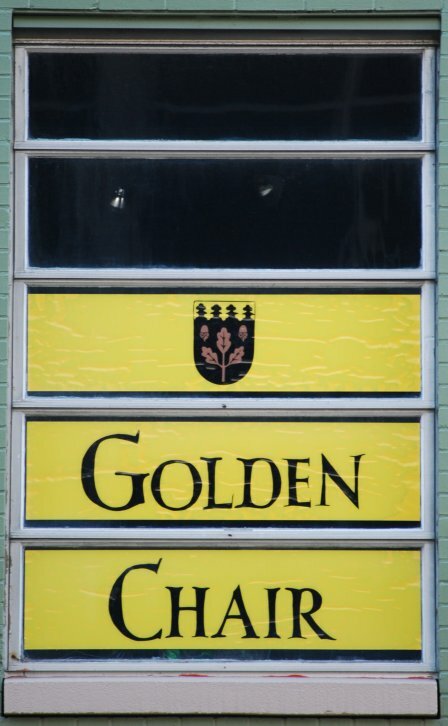 Golden Chair, Inc. is the name of the company, whose showroom is in the building. (There are a lot of furniture companies in High Point.) They manufacture occasional chairs and sofa sets. The “arms” they use as their logo might be blazoned as Sable, a spring of three oak leaves between in chief two acorns, a chief trefoily counter-trefoily or.